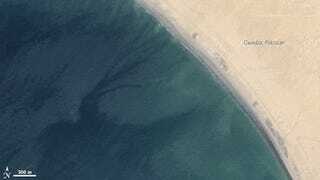 NASA's Earth Observing-1 (EO-1) satellite captured the birth of the new island off the coast of Gwadar, Pakistan after this week's 7.8 earthquake. Read below for a longer look at this rocky, flammable gas-emitting landform that scientists are calling a "mud volcano" and why this little island might not last very long. As of today, the earthquake has claimed 515 lives, with attacks from insurgents hampering relief efforts. What Happens When Natural Disasters Instantly Change Our Maps?